As the bountiful harvest of Thy sowing of salvation, the lands of North America offer unto Thee, O Lord, all the saints who have shone in them. By their prayers keep the Church and our land in abiding peace through the Theotokos, O most Merciful One! Today the choir of Saints who were pleasing to God in the lands of North America now stands before us in the Church and invisibly prays to God for us. With them the Angels glorify Him, and all the Saints of the Church of Christ keep festival with them; and together they all pray for us to the Pre-eternal God. Introduction to Orthodoxy Class will be held following Vespers on Wednesday evening this week. Ss. Mary and Martha Women’s Fellowship will meet this Thursday (July 11), 7.00 pm at Helen’s house. Our parish Patronal Feast will be this Saturday (July 13). Great Vespers will take place the night before (Friday, July 12), with Liturgy on Saturday morning, followed by a barbeque picnic. Please do your utmost to come, and let us honor our Heavenly Patron the Holy Archangel Gabriel together! On the second Sunday after Pentecost, each local Orthodox Church commemorates all the saints, known and unknown, who have shone forth in its territory. 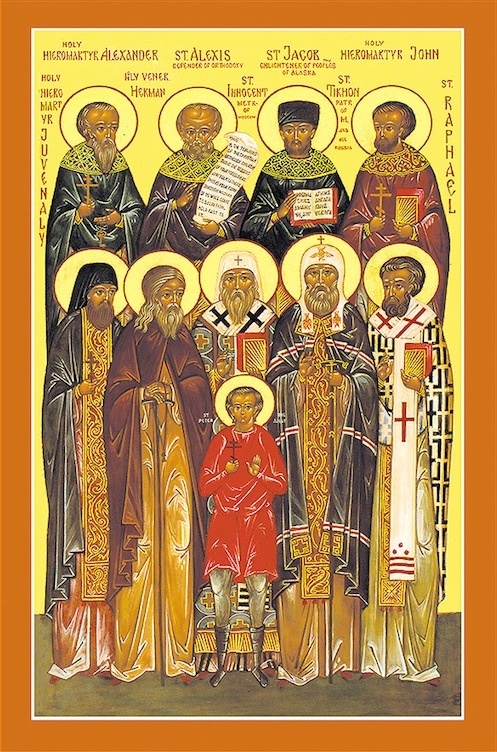 Accordingly, the Orthodox Church in America remembers the saints of North America on this day. Saints of all times, and in every country are seen as the fulfillment of God’s promise to redeem fallen humanity. Their example encourages us to “lay aside every weight, and the sin which so easily besets us” and to “run with patience the race that is set before us” (Hebrews 12:1). The saints of North America also teach us how we should live, and what we must expect to endure as Christians. Although it is a relatively young church, the Orthodox Church in America has produced saints in nearly all of the six major categories of saints: Apostles (and Equals of the Apostles); Martyrs (and Confessors); Prophets; Hierarchs; Monastic Saints; and the Righteous. Prophets, of course, lived in Old Testament times and predicted the coming of Christ. The first Divine Liturgy in what is now American territory (northern latitude 58 degrees, 14 minutes, western longitude 141 degrees) was celebrated on July 20, 1741, the Feast of the Prophet Elias, aboard the ship Peter under the command of Vitus Bering. Hieromonk Hilarion Trusov and the priest Ignatius Kozirevsky served together on that occasion. Several years later, the Russian merchant Gregory I. Shelikov visited Valaam monastery, suggesting to the abbot that it would be desirable to send missionaries to Russian America. On September 24, 1794, after a journey of 7,327 miles (the longest missionary journey in Orthodox history) and 293 days, a group of monks from Valaam arrived on Kodiak Island in Alaska. The mission was headed by Archimandrite Joasaph, and included Hieromonks Juvenal, Macarius, and Athanasius, the Hierodeacons Nectarius and Stephen, and the monks Herman and Joasaph. St Herman of Alaska (December 13, August 9), the last surviving member of the mission, fell asleep in the Lord in 1837. Throughout the Church’s history, the seeds of faith have always been watered by the blood of the martyrs. The Protomartyr Juvenal was killed near Lake Iliamna by natives in 1799, thus becoming the first Orthodox Christian to shed his blood for Christ in the New World. In 1816, St Peter the Aleut was put to death by Spanish missionaries in California when he refused to convert to Roman Catholicism. Missionary efforts continued in the nineteenth century, with outreach to the native peoples of Alaska. Two of the most prominent laborers in Christ’s Vineyard were St Innocent Veniaminov (March 31 and October 6) and St Jacob Netsvetov (July 26), who translated Orthodox services and books into the native languages. Father Jacob Netsvetev died in Sitka in 1864 after a life of devoted service to the Church. Father John Veniaminov, after his wife’s death, received monastic tonsure with the name Innocent. He died in 1879 as the Metropolitan of Moscow. As the nineteenth century was drawing to a close, an event of enormous significance for the North American Church took place. On March 25, 1891, Bishop Vladimir went to Minneapolis to receive St Alexis Toth (May 7) and 361 of his parishioners into the Orthodox Church. This was the beginning of the return of many Uniates to Orthodoxy. St Tikhon (Belavin), the future Patriarch of Moscow (April 7, October 9), came to America as bishop of the diocese of the Aleutians and Alaska in September 1898. As the only Orthodox bishop on the continent, St Tikhon traveled extensively throughout North America in order to minister to his widely scattered and diverse flock. He realized that the local church here could not be a permanent extension of the Russian Church. Therefore, he focused his efforts on giving the American Church a diocesan and parish structure which would help it mature and grow. St Tikhon returned to Russia in 1907, and was elected as Patriarch of Moscow ten years later. He died in 1925, and for many years his exact burial place remained unknown. St Tikhon’s grave was discovered on February 22, 1992 in the smaller cathedral of Our Lady of the Don in the Don Monastery when a fire made renovation of the church necessary. St Raphael of Brooklyn (February 27) was the first Orthodox bishop to be consecrated in North America. Archimandrite Raphael Hawaweeny was consecrated by Bishop Tikhon and Bishop Innocent (Pustynsky) at St Nicholas Cathedral in New York on March 13, 1904. As Bishop of Brooklyn, St Raphael was a trusted and capable assistant to St Tikhon in his archpastoral ministry. St Raphael reposed on February 27, 1915. The first All American Council took place March 5-7, 1907 at Mayfield, PA, and the main topic was “How to expand the mission.” Guidelines and directions for missionary activity, and statutes for the administrative structure of parishes were also set forth. In the twentieth century, in the aftermath of the Russian Revolution, countless men, women, and children received the crown of martyrdom rather than renounce Christ. Sts John Kochurov (October 31) and Alexander Hotovitzky (December 4 and August 7) both served the Church in North America before going back to Russia. St John became the first clergyman to be martyred in Russia on October 31, 1917 in St Petersburg. St Alexander Hotovitzky, who served in America until 1914, was killed in 1937. In addition to the saints listed above, we also honor those saints who are known only to God, and have not been recognized officially by the Church. As we contemplate the lives of these saints, let us remember that we are also called by God to a life of holiness.